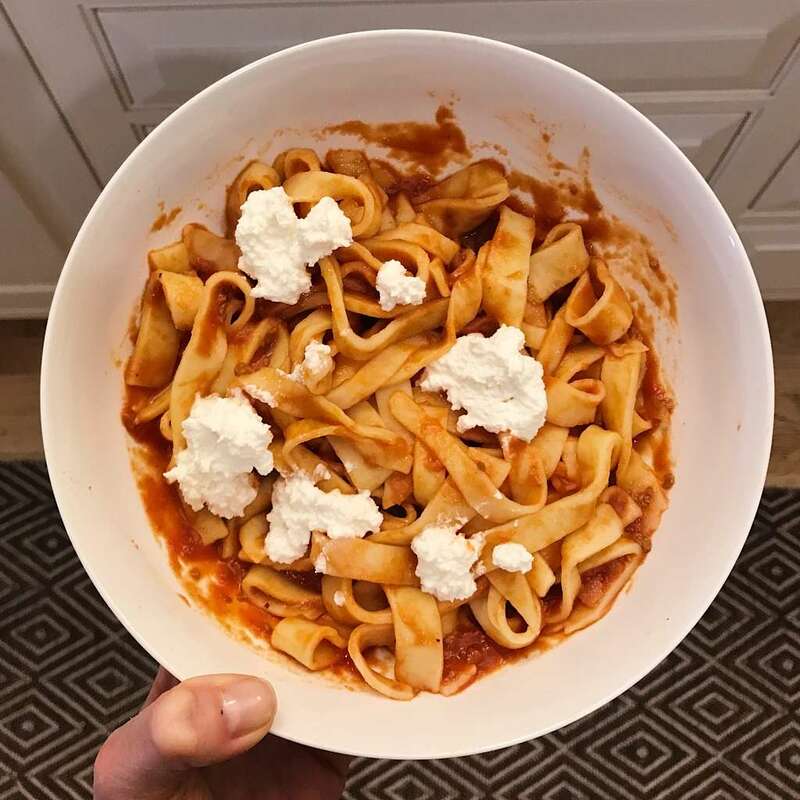 This is my son's recipe for fresh, homemade gluten-free pasta and it is unreal! Only 2 ingredients and amazing flavor + tender texture! 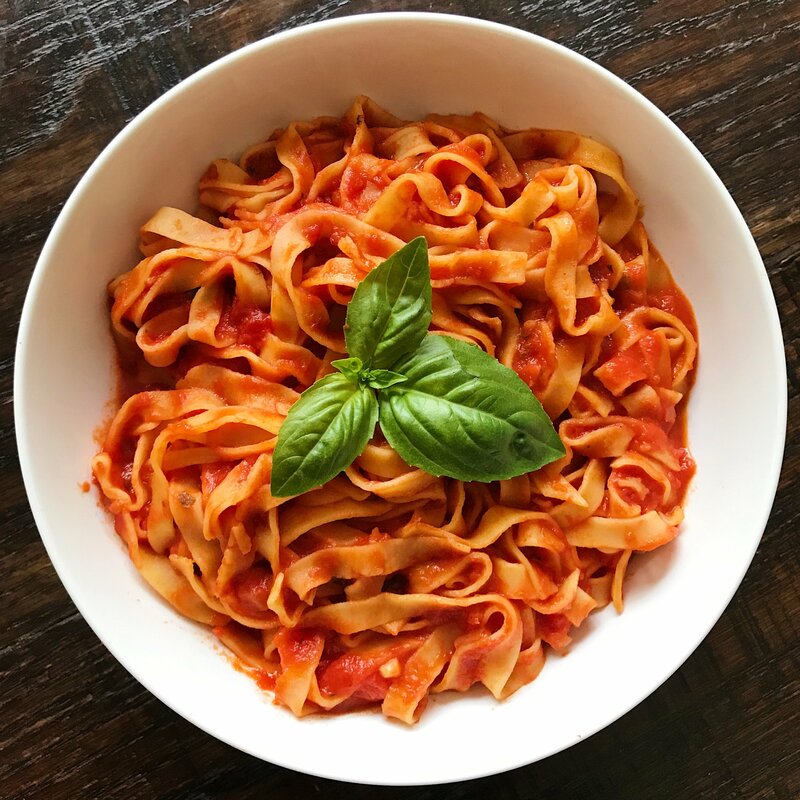 If you’re looking for my son’s Simple Marinara Sauce, click here. 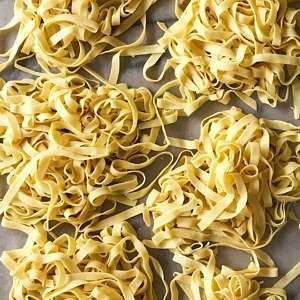 If you’re looking for Homemade Gluten-Free Pasta, you’re in the right place! 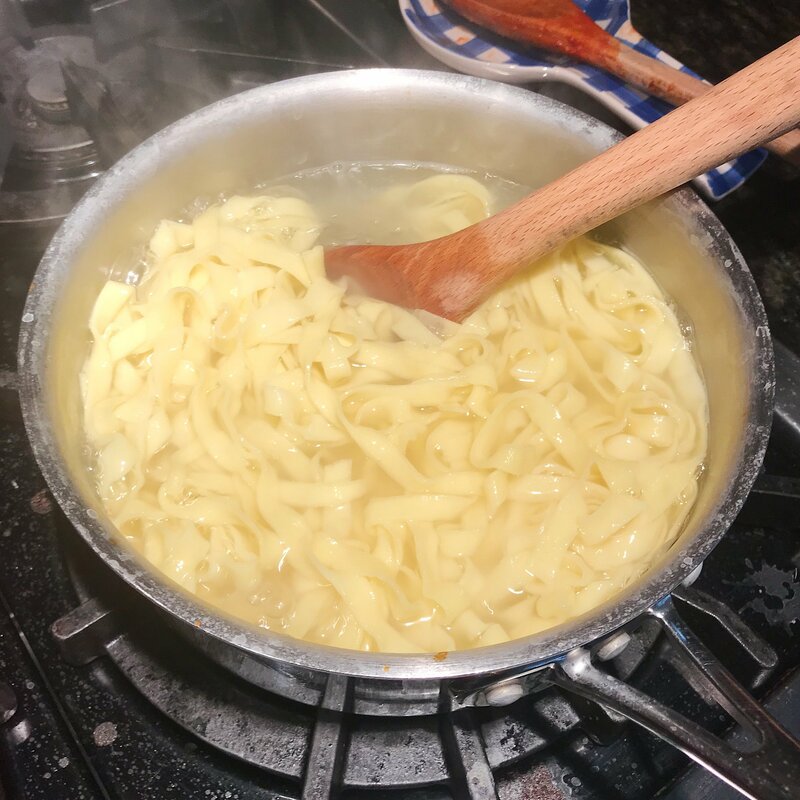 If you follow my Instagram stories, you’ve seen my son make fresh, homemade gluten free pasta many times. He first made it one Sunday evening in May 2018. We didn’t own a pasta maker and my husband and I watched in awe as my son mixed up a dough (he threw out the first try and nailed it on the second!) and then rolled and cut pasta with a knife. We literally couldn’t believe our eyes and after sneaking a taste were blown away! We bought him a pasta maker a few weeks later for his birthday and he’s been making pasta with a pasta machine ever since! He makes it without a recipe and by taste and feel. And each time I share it to Instagram stories I get so many requests for the recipe, I flip a bit. 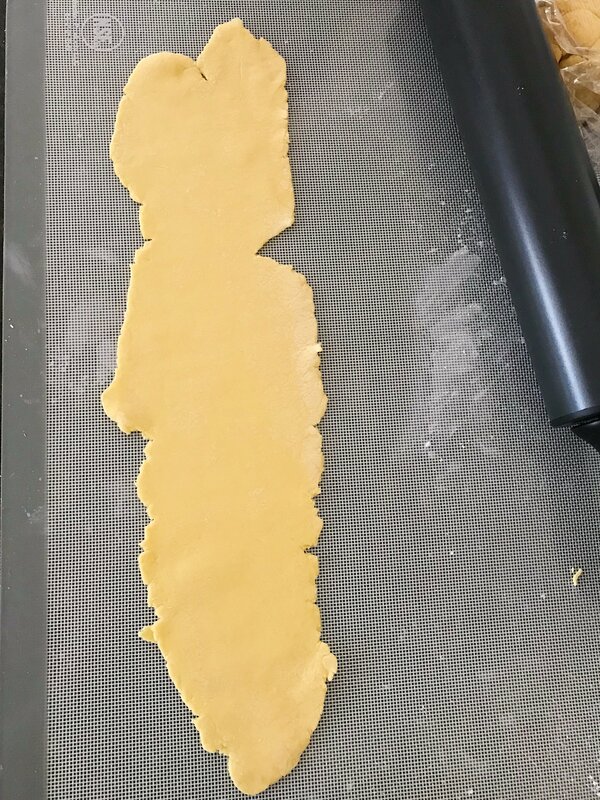 SO a few weeks ago, when we had February break and a staycation, I asked my son to recreate his pasta so that we could measure and write down directions. We made it twice that week and today we are finally sharing the recipe! 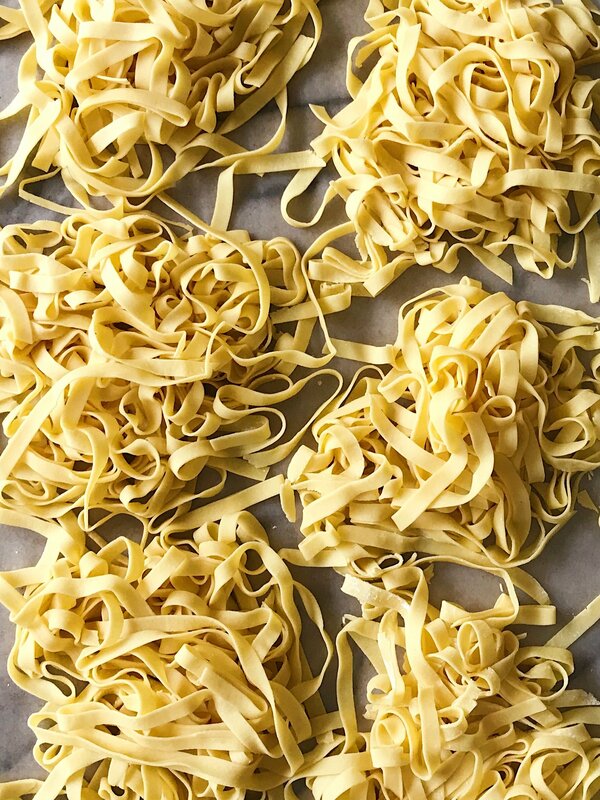 One caveat: there may be a learning curve in making homemade pasta. You start to get a feel for what the right texture and dough thickness is. So give it a try, play with it and let me know how it goes. Here are some tips and photos you can refer to as you make your own. First, there are only two ingredients! Eggs and Gluten-Free Flour (with xanthan gum). 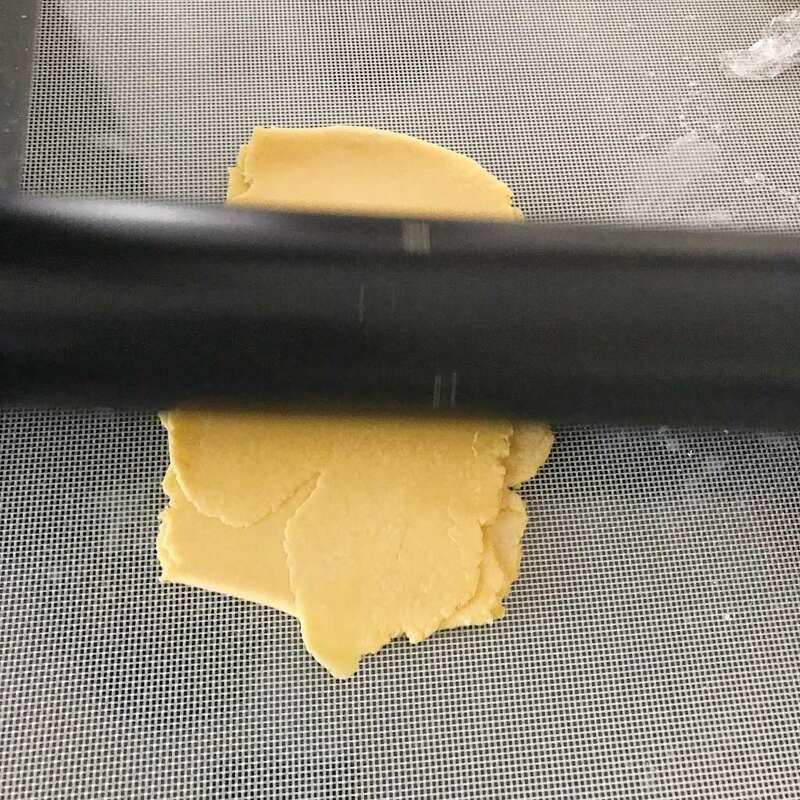 We used GF Jules all purpose flour – affiliate link. 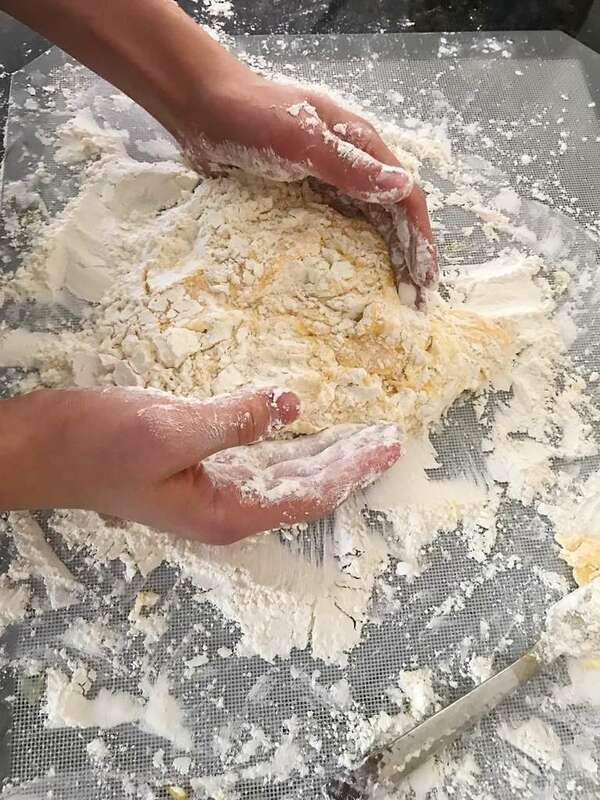 You start by adding the flour to a pastry mat and creating a volcano shape. Then you add crack the eggs directly into the center and whisk. 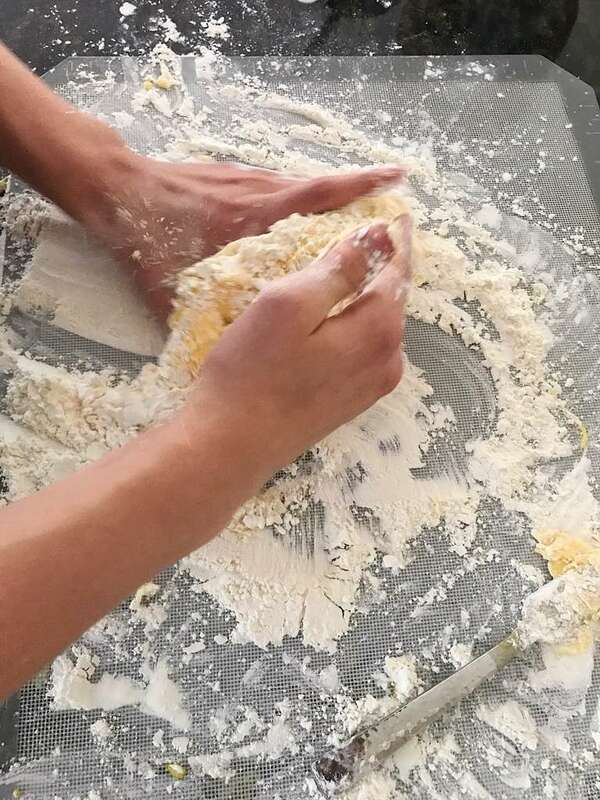 Slowly whisk the flour into the eggs, then use your hands to form into a dough and knead it. Form into a ball, then wrap ball in plastic wrap and let sit for 30 minutes. After resting 30 minutes. divide dough into parts, wrap 3 in plastic and set aside. Then working one dough at a time, roll the dough to 1/8 of an inch thick. 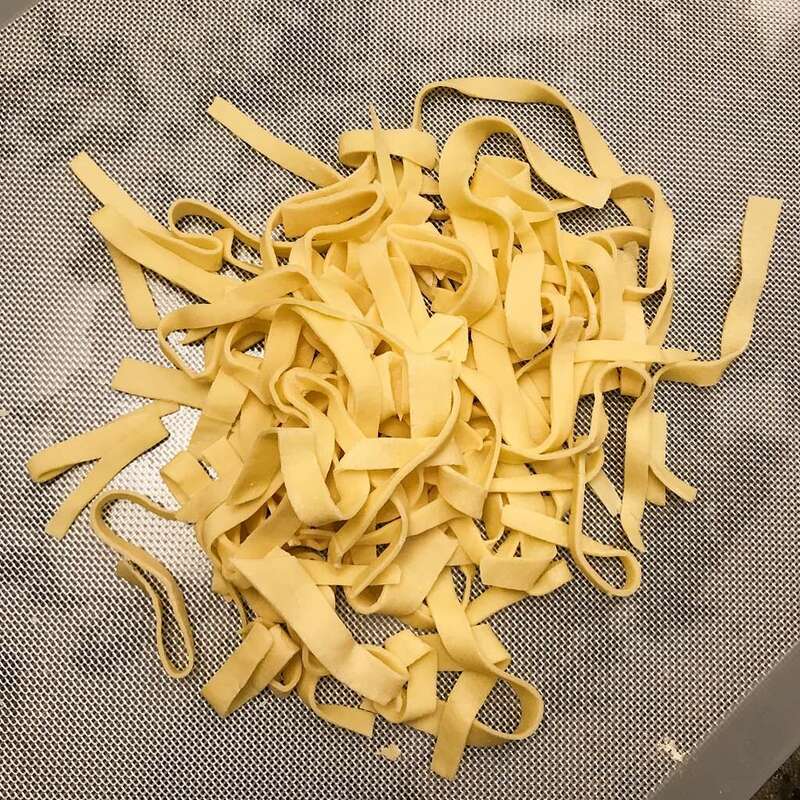 Using a pasta machine (we use a Mercato Atlas 150), roll the dough through the machine starting at the lowest setting and increasing to higher settings. The dough will be long, not entirely smooth and the edges not squared. 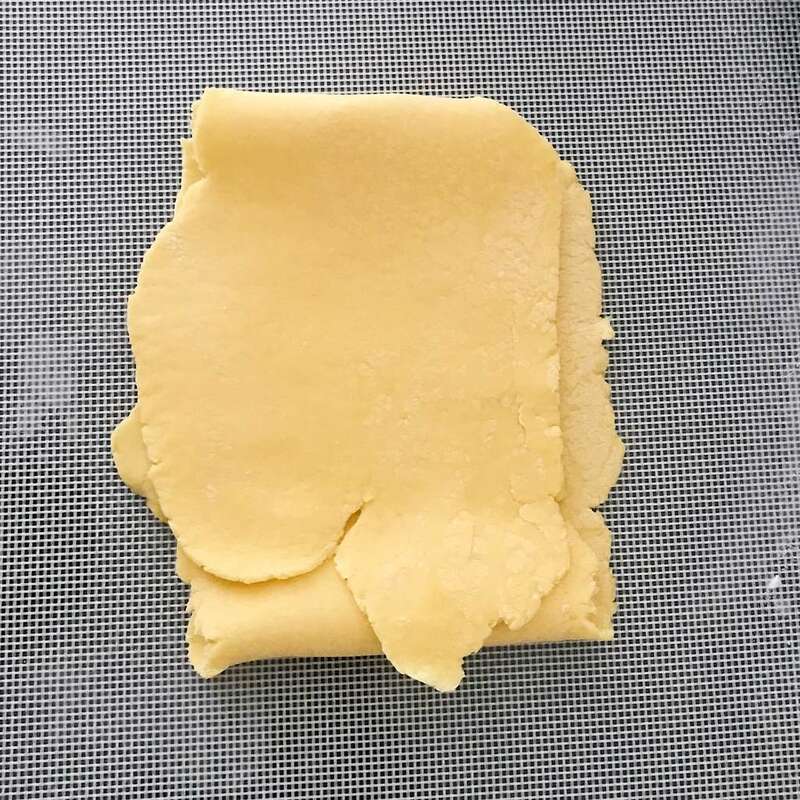 You’ll fold the dough into thirds, roll it to 1/8 of an inch again, and repeat the process of rolling the dough through the machine until you can see your hand through it. This will smooth out the dough and square the edges. 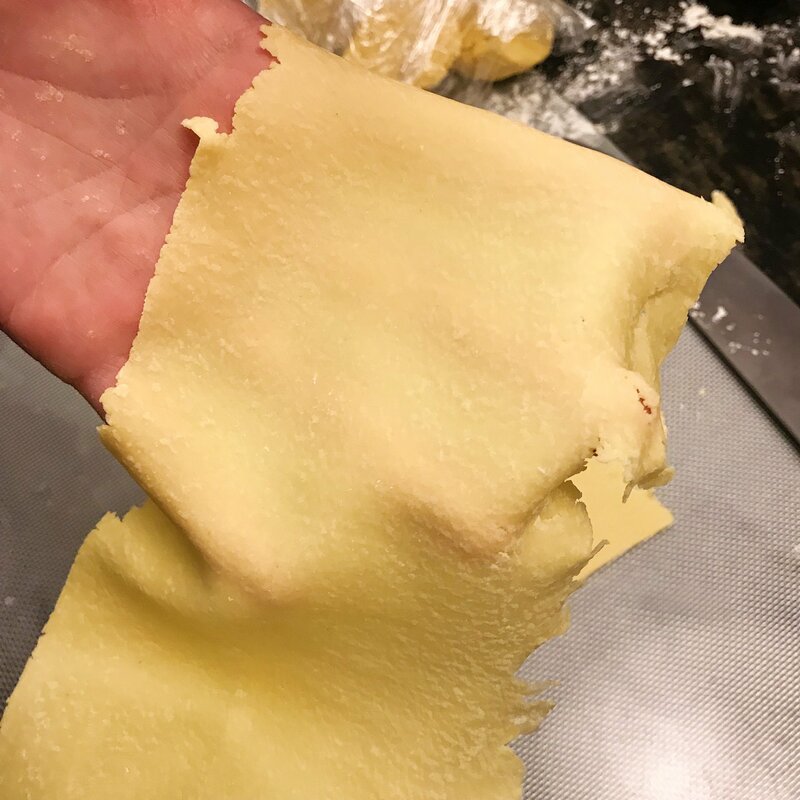 When you can see your hand through the dough, it is ready to cut into actual pasta! 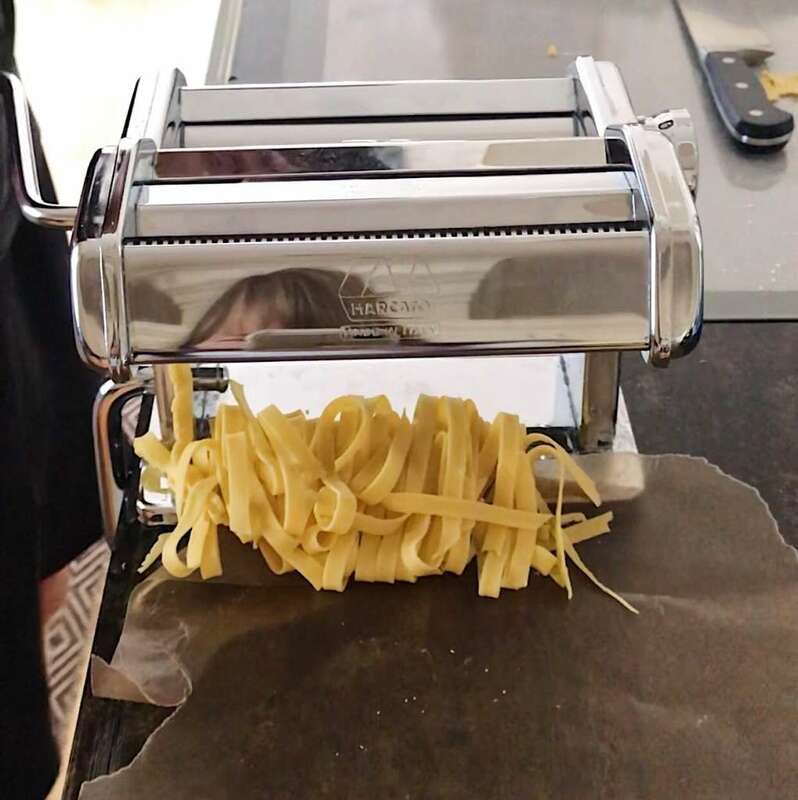 We have only used the fettuccine attachment on our pasta maker and it works beautifully. You can cook the pasta immediately or dry it overnight. It stays well for a few days. It cooks quickly, just 2-3 minutes when it’s fresh, 4-5 minutes when it’s dried. Both ways, the texture is tender but firm, holding together well. And the taste is amazing! My son likes to eat it with his own homemade tomato sauce. It’s shown here with my son’s homemade Simple San Marzano Marinara Sauce. 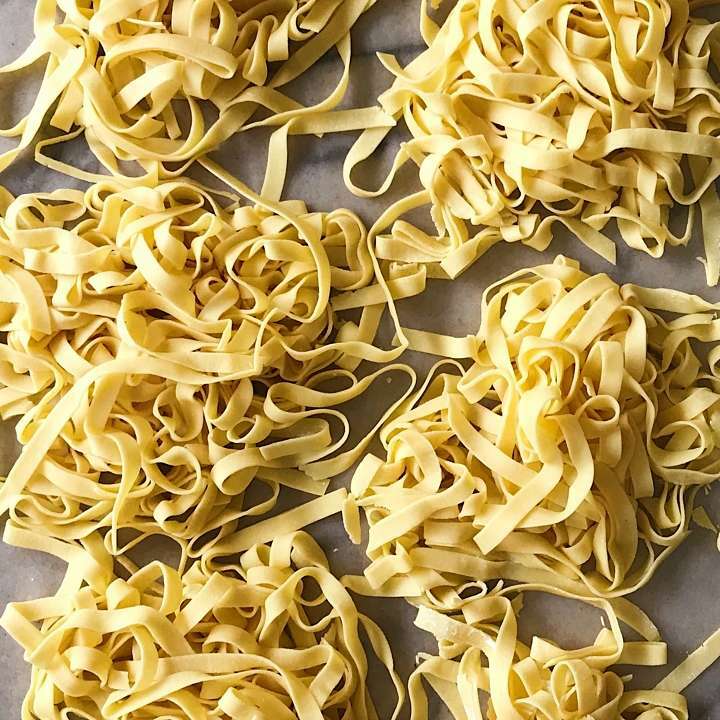 Hope you have fun making this pasta and love it as much as we do! With just 2 ingredients, this gluten-free pasta is unreal! Tender texture that holds together well and amazing flavor. Prep time includes letting dough rest 30 minutes. 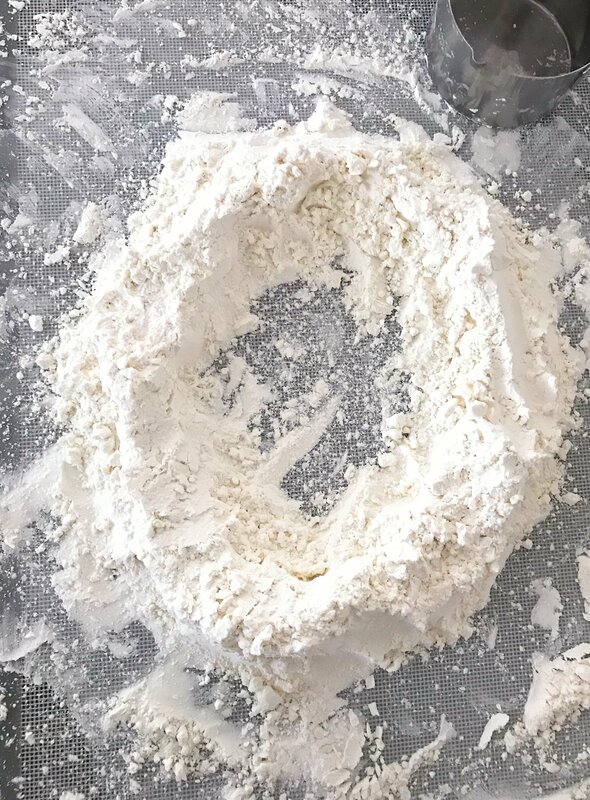 On a pastry mat, add flour and create a volcano shape with the flour on outside and empty center. Crack eggs directly into the center and whisk. Then slowly whisk flour into the egg mixture until it starting to form a dough. 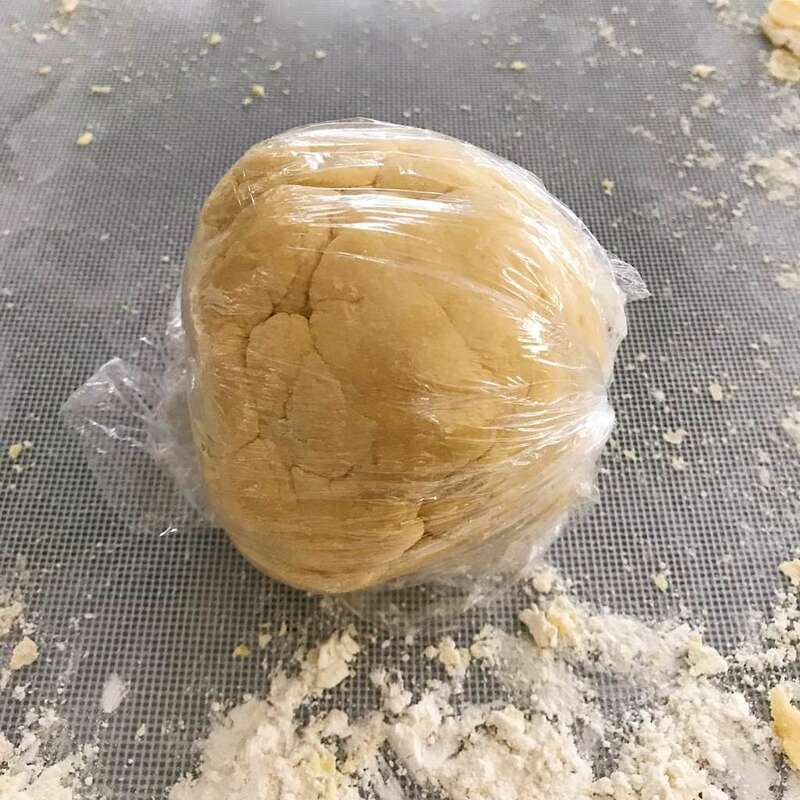 Form dough into a ball, wrap in plastic wrap and let it rest for 30 minutes. Cut the dough into 4 pieces. Keep 3 pieces wrapped in plastic so they don't dry out and one piece at a time, roll to ⅛ of an inch thick. 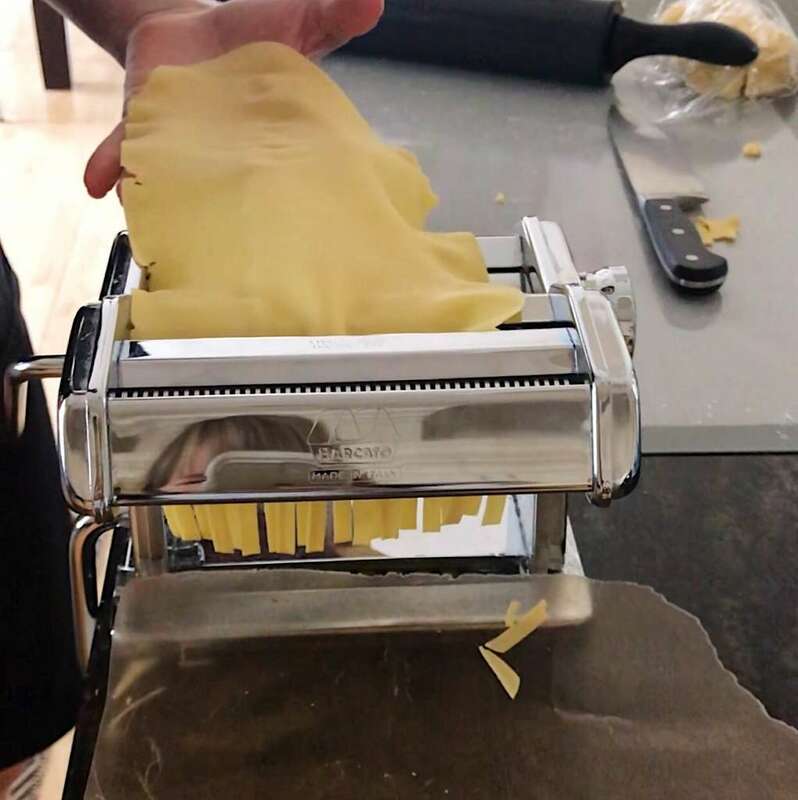 Using a pasta machine (we use the Marcato Atlas 150, with 9 settings), starting at the lowest setting (0) roll it through the machine 1-2 times, then raise the setting to 1, roll it through the machine 1-2 times, raise to 2, and roll once, raise 3 an roll once. At this point the dough will be quite long and the edges will not be "clean". 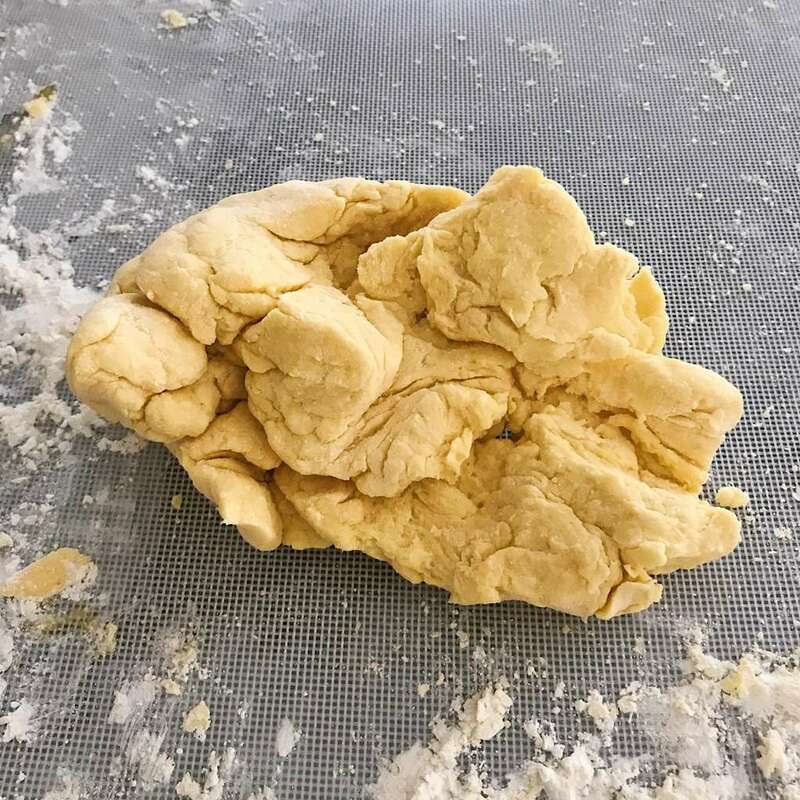 Fold dough into thirds and using a rolling pin, roll again to about the ⅛ an inch. This helps smooth out the pasta and squares the edges. Put through the pasta machine on lowest the setting -- it should go through lowest setting with some ease. If not, roll it thinner. Repeat as above, working lowest to highest, rolling dough through the machine once at each setting until about setting 5. NOTE: When rolling the dough through the machine, do not let the edges touch the end of the machine. It's thin enough when you can see your fingers through it. For us, it's thin enough at setting 5, for another machine it may be different. 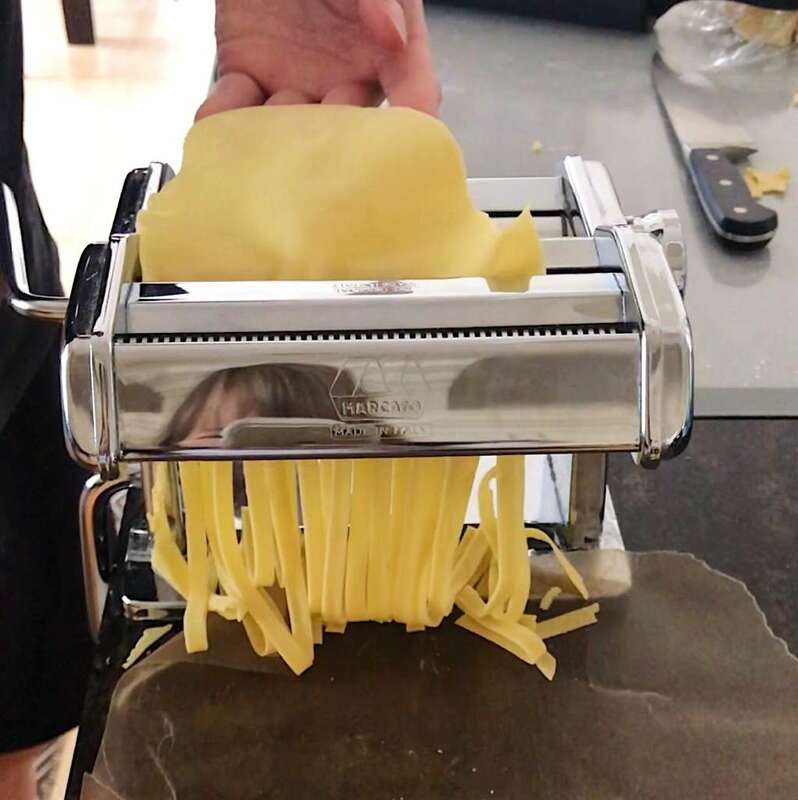 Put it through the pasta machine to cut it into the shape you want -- we use the fettuccine attachment. 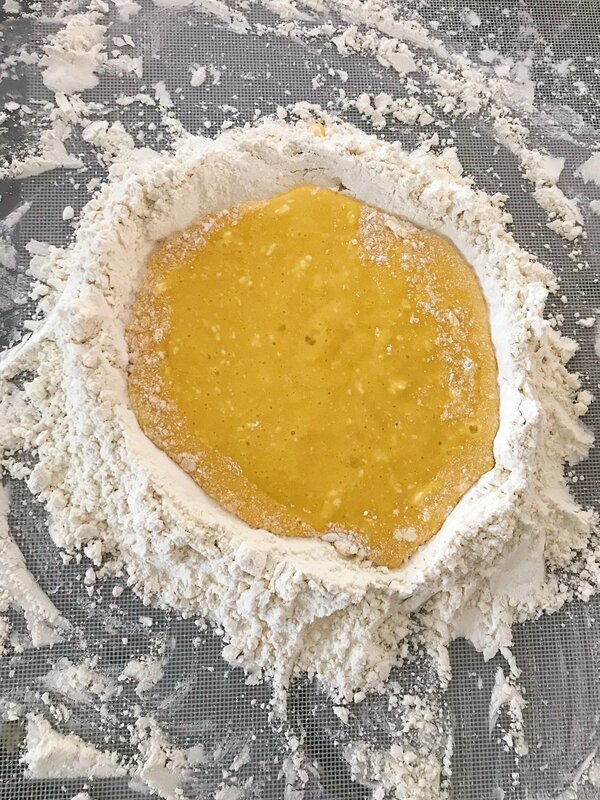 Then gently toss shaped pasta together with a little flour so it doesn't stick together. Can be cooked fresh or dry overnight and cook it dried. Serve with your favorite tomato sauce. Enjoy!